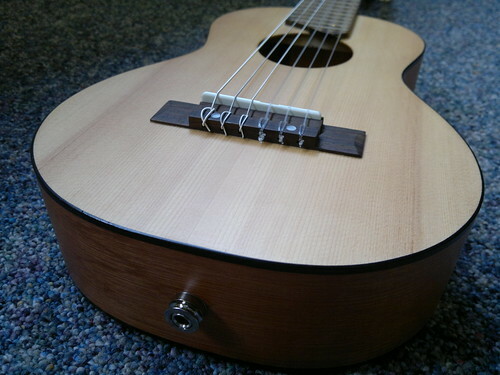 Yamaha Guitalele… with transducer pickup, a photo by tawalker on Flickr. I can’t remember the last time a musical instrument “captured” me quite as much as the Yamaha GL-1 Guitalele (well, unless you count the iPod Touch with Garageband, and even that comes second), but I couldn’t help thinking it was missing a couple of things for my taste: an internal transducer pickup and an extra strap button… now my GL-1 has both. Yamaha: how about a “GL-1x” – an electro model, perhaps with a cutaway? what pickup did you install? are you happy with in? Hi Frank – I can’t remember the exact pickup I bought (off-hand), though it was a relatively inexpensive one from Amazon (about £15). It does the job, although it’s a bit “microphonic” and picks up every rub and knock – fine for live use, but I’d always want to mike up the guitalele in the studio. Hope this helps – thanks for your comment!